Let me get this out of the way: the trillion dollar F-35 fighter jet program is an embarrassing mess. But it’s hard not to marvel at the very expensive technology’s promises. This conflict squeezed my brain this week, when the Air Force stopped by Gizmodo’s office with a $400,000 F-35 helmet in hand. They even let me wear it. The helmet is undeniably beautiful, a glistening orb of woven carbon fiber with a computer hidden underneath. It belongs to Major Will Andreotta, a seasoned fighter pilot based out of Luke Air Force Base and the F-35A Heritage Flight Commander. The Major was in the area to fly his F-35A at the Atlantic City Air Show this weekend. The Air Force recently announced that the initial squadron of F-35s will be combat ready by the end of this year. So despite the endless reports of bugs and hold ups, the very expensive fighter jets do fly. And the very expensive helmet sure looks cool. With the HUD, the pilot can actually look down at the floor of the jet and see the ground. 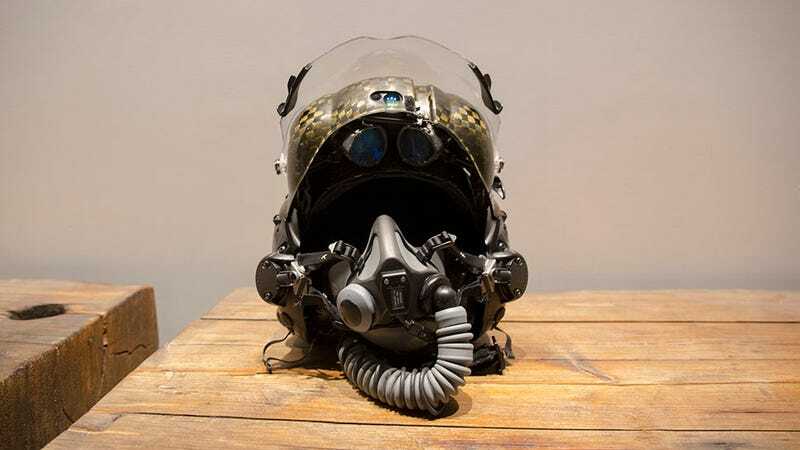 As Maj. Andreotta explained, the $400,000 price tag accounts not only for the helmet itself but also the computer system that it connects to in the aircraft. And the helmet is considered an integral part of the F-35 weapons system. So without plugging it into the aircraft, the helmet is basically a really nice helmet. Those two things on the bottom that look like WALL-E eyes are projectors for the HUD. Above is the night vision system. The F-35 helmet is also insanely light, weighing in at 5.4 pounds or just a few ounces heavier than a football helmet. (Although, like the rest of the F-35 program, even the weight of the helmet has been subject to controversy lately.) Each helmet is custom-fitted to the pilot using a complex set of 3D scanners to increase comfort and safety. And even though it wasn’t built for me, Maj. Andreotta’s helmet felt pretty damn good when I put it on. The snakeskin-looking band houses the cables that connect the helmet’s processor and sensors to the aircraft. Then again, it was my childhood dream to be a fighter pilot. My grandfather, father, and brother all served in the Air Force. I have bad eyes and a bum ear, so I got into blogging instead. As it were, I’ve been covering the troubled F-35 program for years. It’s frustrating to watch the Pentagon throw a trillion taxpayer dollars at a weapon that doesn’t work right! But to sit down with a pilot who flies an F-35 and see the $400,000 helmet I’d read about was a weird thrill. The fact that I couldn’t actually see the helmet in all of its HUD-laden glory seemed like an appropriate metaphor for the state of the F-35 program as a whole. The technology sounds—and probably eventually will be—amazing. The 21st century sensors that spot threats a pilot would have otherwise missed might save lives. And apparently, the F-35 is almost there. In the meantime, average civilians can watch these impressive jets at airshows. Journalists like me can marvel at its pricey components and wonder when they’ll start to make a difference in combat. And you should just feast your eyes on this F-35 helmet. The carbon fiber really is stunning.